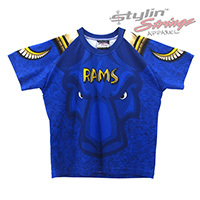 The Rams women's sublimated lacrosse v-neck shooting shirt was for Kennard-Dale youth lacrosse in south central Pennsylvania. 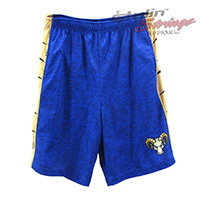 We designed the custom Ram head logo as well as the font to mimic the look of the horns. 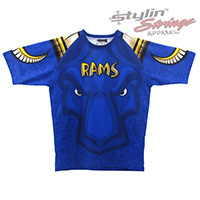 We also took the horns and wrapped the shoulders to let the mascot embody the garment. This was polished off by making a custom hair pattern that gives it a subtle texture along with the ghosted Ram face. The back bottom was stylized with a full custom drawn Kennard-Dale font.